It’s time to look at an old drama film. It’s definitely got a pretty unique premise although the film’s long run time does stretch it to the max at times. It’s definitely a unique movie nonetheless, but you probably won’t be on the main character’s side by the end. He made too many mistakes too many times. After a while you just gotta walk away. The film starts off in the present, but only stays there briefly. Stevens is going to meet with Miss Kenton as he hopes to re-hire her for the mansion. There just aren’t enough people around to service the place and she was always one of the best. However, a lot of things have changed since they last met. Then we get a flashback which goes for about 95% of the film to back when they used to work for Darlington. See, Stevens is the head butler and he trains everyone else. Miss Kenton was hired as the main housekeeper. Then you have a bunch of other staff who show up as needed and Stevens’ father who is the under butler. At first all is well, but then the head of the house, Lord Darlington starts to seemingly side with the Nazi’s. Making matters even worse is the fact that Stevens’ father is too old to be working and keeps making mistakes. Will Stevens make the right call here? Unfortunately he never does. Stevens is constantly making the wrong calls throughout the film. He’d rather overlook his father’s mistakes than call him out on it. Likewise, he rarely has regard for anyone else. He’s very quick to distance himself and takes everything Miss Kenton says super personally. While to an extent it’s not good to get caught up in the politics of the office, he ends up taking it too far here. When someone asks him a question he always pretends not to have any clue what they are talking about. Then when his boss Darlington starts to go over the edge with firing employees and such, he just watches and obeys. He even goes through with firing the girls even though they had been great workers. You just can’t sympathize with the guy at all. All the scenes in the modern day just hurt Stevens further. He’s not a good lead and Miss Kenton made the right move in leaving. That romance angle wasn’t handled too well though. She hints that she was only marrying the other guy because Stevens wasn’t paying her any attention. If so, did she truly love the guy? That seems like a textbook rebound if you ask me. If that guy was second fiddle, then that doesn’t seem like it’ll be a great arrangement. Kenton was certainly great at her job but that was unlikely to be recognized in such a place. Darlington seems reasonable for a while, but as the film goes on he starts to get pretty iffy. The scene where he has Stevens fire the two girls shows how far he was gone by that point. The new owner of the house is a lot more likable though. His name is Lewis and we also see him in the flashbacks. He was the only guy to stand up to this alliance from the start and warned that things wouldn’t be as rosy as they appeared. He ended up being quite right. I wouldn’t have minded seeing more of him. The guy was definitely a fun character. As I mentioned, the film is over 2 hours though. You’re probably wondering what else they could do in 2 hours and that’s just it…there’s not much more of a plot to talk about in this period of time. The rest is all about the drama and as you can imagine that is hard to hold a film with. The dialogue is good and the writing is solid, but the characters aren’t very likable. Right from the start they’re all warned not to start romance with the other employees, but nobody listens including the main characters. As a result they fall into the same dilemmas that they were warning against at the start. The characters also play a very passive role in the film. As the events are transpiring they don’t actually do anything about them. To their defense, there is not much that they actually could do, but it does limit how exciting the film can get. As I mentioned, this one’s a pure drama so excitement isn’t one of the priorities. At least the film doesn’t really make any mistakes either. It just goes through the motions. 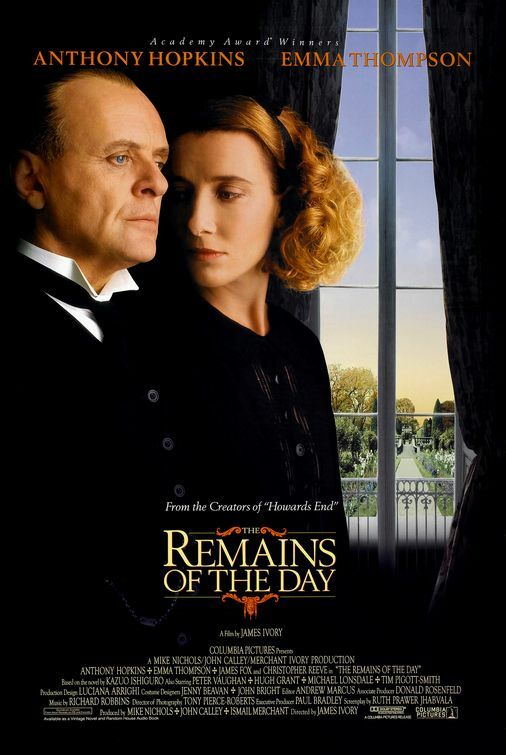 Overall, The Remains of the Day is a fundamentally sound movie. It makes no real errors and just proceeds to go through its plot without making any mistakes. At the same time, there is no real hook to the film either. It’s almost as if it’s on auto pilot. By the second half of the film you are either really invested in the characters or your interest will have completely died out. It will certainly end up being one of the two. Still, if you haven’t seen a film like this then it’s a good idea to. By “a film like this” I mean a movie that plays and it’s like you’re a spectator. There’s nothing good or bad about it. It’s just going through the motions. It’s like watching the medium in its purest form in a sense.